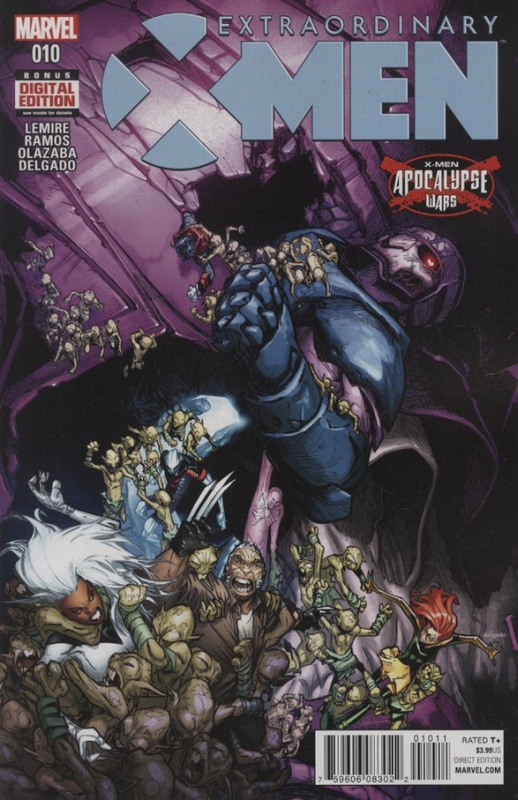 I had to add Reilly Brown & Jim Charalampidis’ Apocalypse Horsemen variant to my Wishlist. After taking an issue off, we are back! It seems like nothing happened in issue nine that I already didn’t know at the end of issue eight. Omega World, 3167 AD. Horseman Colossus is choking Storm, as Old Man Logan tries to free her from his grip. Cerebro has to fight Colossus off but he wrecks her. 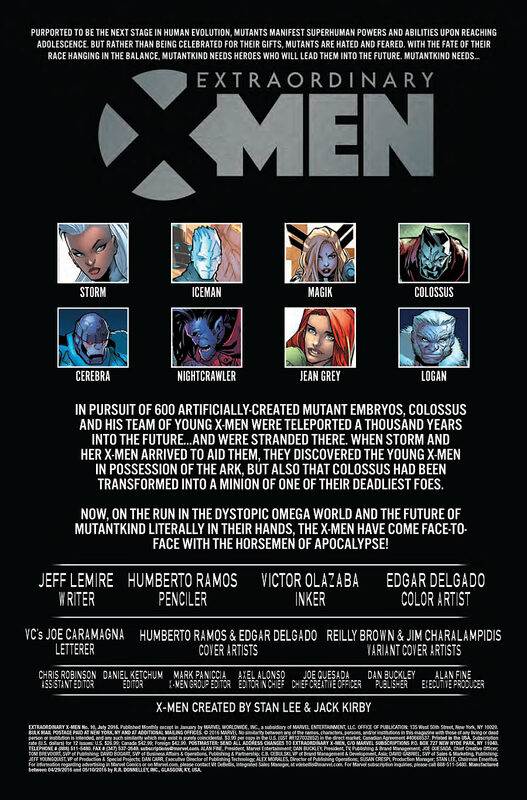 Colossus grabs the ark, that contains 600 mutant embryos. He and the other Horsemen leave. Limbo, Now. Illyana and Sapna are training, Sapna is getting better with magic. I like Sapna’s little friend over there in the corner. Lockheed should be hanging out with Lockheed and so these two could become friends. We get a good look of Sapna in her X-Trainee uniform. But it isn’t very similar but I really enjoyed that take of the basic X-uniform from that film. 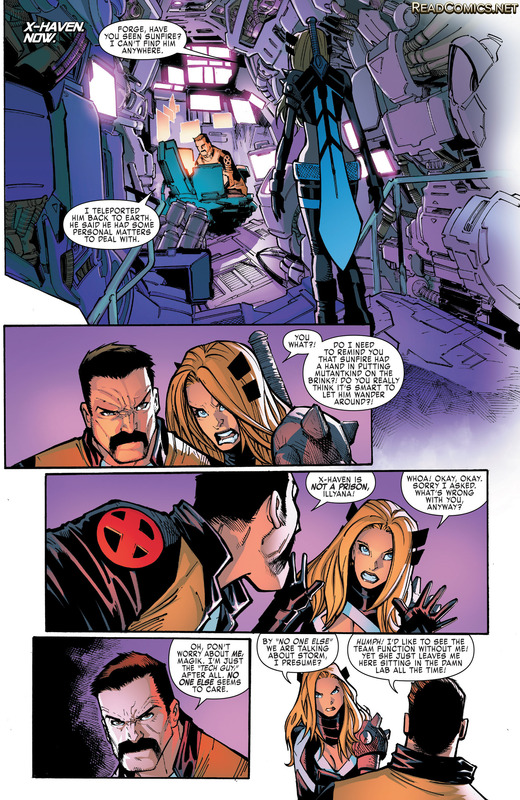 Illyana wants to really start pushing Sapna but Sapna quotes Doctor Strange, who doesn’t want her going to hard. Magik tells Sapna a secret, Doctor Strange can be a stick in the mud. These two are very fun together. They need a spin off! Illyana suspects that Sapna can reanimate the dead, which isn’t something I would want to do. Sapna agrees that it would be gross. The two of them want to explore the doorways that Sapna can create within Limbo but they want to wait until someone else can defend X-Haven. Illyana, showing a tender side, gives Sapna a gift. The gift is Magik’s old New Mutants uniform, which Sapna really enjoys! Look at the two of them hugging, so sweet! I also like Illyana’s headdress things being not too tall, sort of like Batman’s bat ears, not too long and on the shorter side, is how I prefer them. 3167 AD. Cerebra can’t teleport or travel through time, so now the X-Men are stranded. Jean hopes Magik and Forge can save them, now that Cerebra can’t contact them. 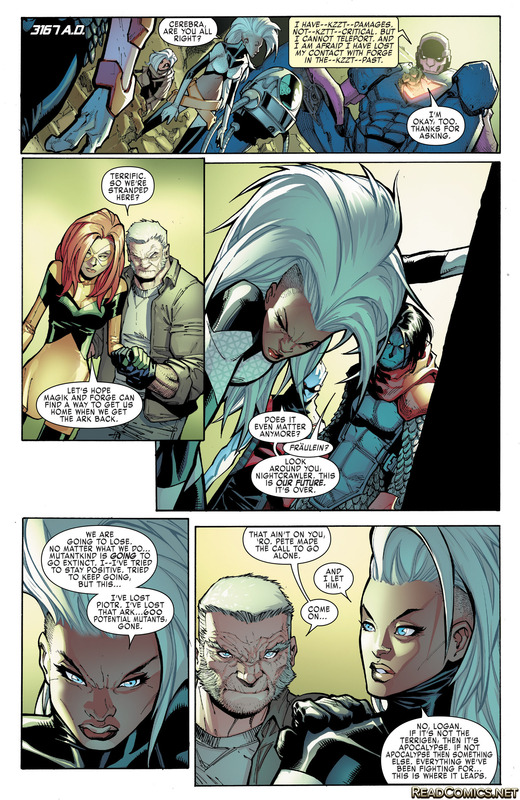 Storm doesn’t even know if it is worth fighting as every future she’s ever seen (and there has been plenty!) turn out for the worst. Iceman tries to rally her together, to keep on fighting. They are being tested, like they always are. This could be a fresh start, something he is currently experiencing himself. Through dialogue, we learn that Colossus and his group of students have been here for a year. As the team travels over Galactus’ dead body, Anole starts trying to get Glob Herman to talk to Jean, as she has a crush on her. I’ll be all for those two dating. She does seem nice enough to talk to him but as they talk, Mole Man’s people grab them from below. Iceman and Old Man Logan start fighting the Morloids off, and Old Man Logan is going crazy nuts to try to get back to Jean. That guy needs to calm down about her. Below, Jean has taken out her would-be captors. Glob Herman is very impress with Teen Jean. X-Haven, Now. 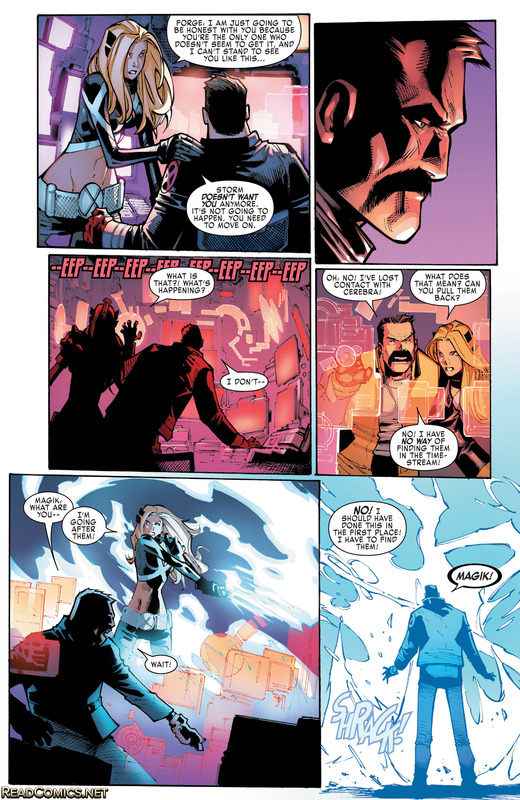 Forge tells Magik that he allowed Sunfire to leave, as he wanted to leave and X-Haven isn’t X-Prison. Forge is upset that Storm takes him for granted. 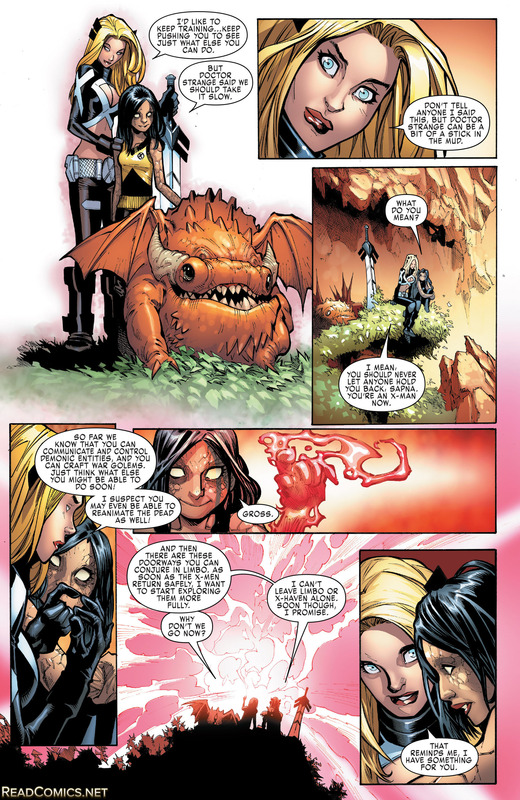 Magik gives him some talk, proving that she’s still herself. 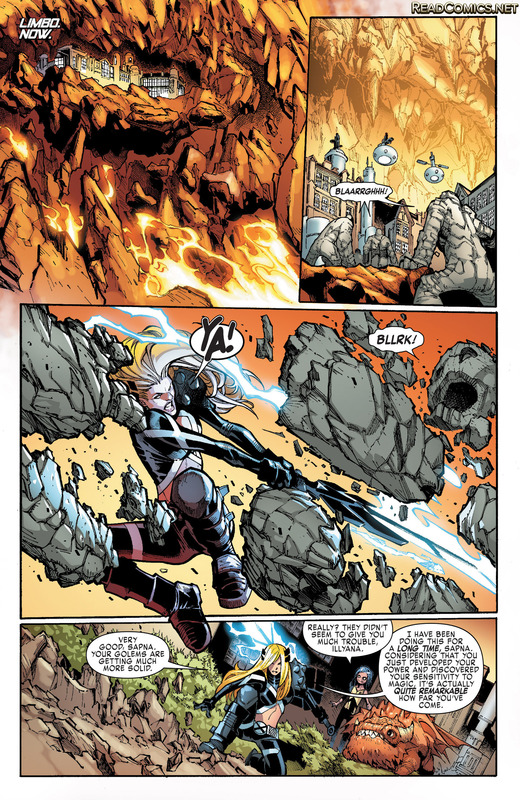 Forge realizes he lost contact with Cerebra and Magik takes off to the future – how she is going to get to their exact point, I’m not that sure. 3167 AD. The X-Men are heading towards the Horsemen’s lair. Colossus fastball specials Venom toward the X-Men. Venom lands on Old Man Logan, and the issue ends with Old Man Venom!